SMS Wolf was a converted cargo vessel of the Hansa Line of Bremen, previously named Wachtfels, and commissioned into the Imperial German Navy, under the command of Corvetten-Kapitän Karl August Nerger. It was a single screw ship, built at Flensberg in 1913, displacing 5809 tons, with a top speed of 11 knots. As an armed merchant raider the ship was fitted with seven 5.9 inch (150mm) guns, four torpedo tubes and 400 mines. In addition a seaplane nicknamed ‘Wolfchen’, (wolf cub) was carried. Manning the ship were 16 Officers and 320 men. As an armed merchant raider the ship was fitted with seven 5.9 inch (150mm) guns, four torpedo tubes and 400 mines. In addition a seaplane nicknamed ‘Wolfchen’, (wolf cub) was carried. Wolf departed Germany on 30 November 1916 in atrocious weather conditions which although most unpleasant, were particularly helpful when breaking through the Royal Navy blockade. Wolfsuccessfully reached the open sea on 10 December. On the night of 16/17 January the ship laid its first minefield off Dassen Island, South Africa, followed by others off Cape Agulhas, Colombo and Bombay. The last field was laid on 19 February and with his task complete Captain Nerger began seeking out enemy shipping. With some irony the first British vessel encountered was the SS Turritella, a sister ship to Wolf, previously the Gutenfels of the Hansa Line, captured at the beginning of the war, at Port Said. They met on 27 February and the procedure used by Captain Nerger became the standard for all boardings. The enemy ship was signalled to stop immediately and informed that a boat was being sent across. A boarding party comprising two officers, one petty officer and 10 seamen would board the enemy ship, the officers dressed in their white uniforms, armed with swords and pistols and the seamen armed with rifles and bayonets. The officers proceeded to the bridge and the petty officer to the engine room. Having taken control of the ship the captured officers were sent across to Wolf and the ship worked with its normal crew until no longer required, when they too were sent to Wolf. The Master of the Turritella was Captain T.G. Meadows, a New Zealander while the crew was mainly Chinese. Following this capture Captain Nerger learned that some of his crew were guilty of looting and having recovered the stolen items, formally warned his men that such offences were punishable by death. The ship was renamed Iltis, after a ship in which Captain Nerger had served in China in 1900 and 25 mines were put aboard, together with a 12 pounder gun. Kapitän Leutnant Brandes was put in command, with 25 German seamen. 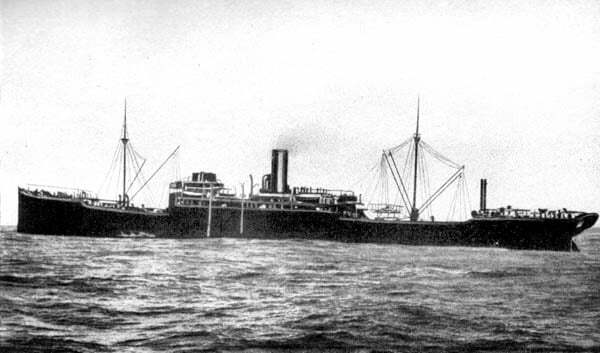 On the night of 5 March Iltis laid the mines in the approaches to Aden, but then encountered HMS Odin. Not being able to escape Lieutenant Brandes scuttled his ship and the crew were captured. Three more ships were captured during March as Captain Nerger made for the Pacific Ocean. Having been at sea for over four months the ship needed some essential maintenance, which required a remote anchorage. On 22 May Wolf anchored on the South Eastern side of Raoul Island (also known as Sunday Island) in the Kermadec Group, some 600 miles to the north of New Zealand. On a local level, Wolf, brought the war to New Zealand in a tangible way. That the war was truly world-wide was not appreciated by the majority of New Zealanders until it was known that the enemy had laid mines off our coast. Ten days later a ship hove into sight and the seaplane was hurriedly made ready and steam raised. The 2nd Mate of the SS Wairuna called Captain Saunders when the strange ship was sighted suggesting that it could be a German raider. The Captain scoffed at the idea, but then the seaplane flew overhead and dropped a message on deck which stated “Do not use wireless. Stop Engines”. As a warning a bomb was dropped ahead of the ship and Captain Saunders complied. Wolf then anchored again and continued with repairs. On the night of 6 June, two officers of the Turritella, Chief Officer A. Steers and 2nd Engineer A.C. Cleland, a New Zealander, slipped over the side in an attempt to escape ashore. Neither was seen again. At 10.00 pm on 25 June, in squally rainstorms and a choppy sea, Wolf laid mines off North Cape, towards the Three Kings Islands, completing the field of 25 mines at 2.30 am the next morning. A second field of 35 mines was laid off Cape Farewell, in the western approaches to Cook Strait on the night of 27/28 June. These mines subsequently sank the SS Port Kembla and the SS Wimmera. Crossing the Tasman Sea more mines were laid of Gabo Island, but the field was not completed because at 10.00 pm a warship was sighted. This is believed to have been the cruiser HMS Encounter escorting a convoy. Wolf was not sighted and cleared the area as quickly as possible. Two ships were captured in July and the Matunga on 6 August which had on board an unwelcome detachment of troops due to relieve part of the garrison at Rabaul. BOTTLE FOUND IN SEA ON DEC 9TH OFF TOLI TOLI CELEBES BY NATIVES CONTAINED TWO PAPERS FORWARDED TO ME BY CONSUL GENERAL AT BATAVIA. FIRST – BEGINS – PRISONERS ON BOARD GERMAN RAIDER PASSED CELEBES THIS DAY 29TH AUGUST: ON HER WAY WE PRESUME TO MINE SINGAPORE PEDRA BLANCA HAVING PREVIOUSLY MINED CAPE TOWN BOMBAY COLOMBO N.CAPE NEW ZEALAND COOK STRAIT GABO ISLAND. CREWS OF FOLLOWING VESSELS ARE ON BOARD, TURRITELLA JUMNA WORDSWORTH DEE WAIRUNA WINSLOW BALUGA ENCORE MATUNGA SHE HAS ON BOARD 110 MINES TO MINE WE THINK RANGOON CALCUTTA SHE WAS FORMERLY WACHFELS OF GERMAN MERCHANT SERVICE – ENDS. On the night of 2/3 September the last minefield was sown off Singapore. On completion there was much cheering from the crew members who anticipated the ship proceeding to a neutral port and being interned for the remainder of the war because there was insufficient coal or supplies to return to Germany. Instead Captain Nerger steamed south, passing through Lombok Strait into the Indian Ocean, encountering the Japanese Haitachi Maru on 26 September. This mounted a 4.7 inch gun and instead of stopping, the Captain ignored two warning shots across the bows and attempted to man the gun and send a message on the radio. Wolf jammed the radio transmission and fired 14 rounds into the ship, killing 16 and wounding 6 of the Japanese crew. Wolf jammed the radio transmission and fired 14 rounds into the ship, killing 16 and wounding 6 of the Japanese crew. At daybreak three days later Wolf captured the Spanish collier Igotz Mendi, bound from Lorenzo Marques to Colombo, with a full cargo of 5,500 tons of coal. The fuel situation in the raider did not allow for legal niceties and the fact that the Spaniard was technically a neutral, was overridden by its destination being a British port. Now making ground toward Germany the two ships steamed northwards up the Atlantic. On 26 December, despite a choppy sea, the two ships went alongside each other and transferred some coal, damage being caused to both ships. Making repairs the ships continued northwards. On January 10 they again secured alongside each other, although the weather was even more unsuitable than in December. With little choice, the ships remained alongside each other for 21 hours, bumping heavily all the time, while coal was transferred. The two ships then proceeded independently to attempt to break the British Blockade of Germany. The 27th of January was the Kaiser’s birthday and the day of a most severe gale, later known as the ‘Great Hurricane of 1918’. With high winds and heavy seas, the ship began taking water at a rate of 40 tons per hour and only superhuman efforts of the crew kept Wolf from sinking. Although on the final run home, should they break through the British blockade there were still minefields, both British and German to be negotiated, for which Wolf had no up to date charts. 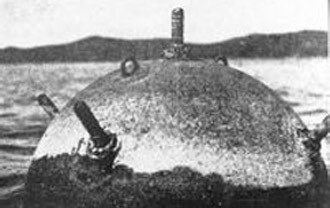 Additionally there was the submarine threat, again from both the British and German Navies, as Wolf could not break radio silence to advise her arrival, without giving her position away. Wolf reached the coast of Norway on 14 February and on the 17th entered the Baltic. The ship was held off Flensberg for a week while preparations for an official welcome home were arranged. Each member of the crew was decorated with the Iron Cross and Captain Nerger received the Pour le Merite. Once the clamour had died down the crew members were posted to other ships and Captain Nerger was appointed Officer in Charge of Armed Trawlers in the North Sea. The Igotz Mendi made a similar course to Wolf, but went aground at the Skaw, the northern point of the Jutland Peninsula on 24 February. A Danish gunboat discovered the identity of the ship, interned the Germans and sent the prisoners to their respective consulates. Wolf was responsible for the loss of 25 Allied vessels; 13 captured, 12 sunk and 3 damaged by mines it laid. Wolf was responsible for the loss of 25 Allied vessels; 13 captured, 12 sunk and 3 damaged by mines it laid. A significant number of Allied warships were employed seeking it out and there was considerable disruption of Allied shipping. In addition, the fact that Captain Nerger and his crew were able to steam their ship, continuously for 15 months, without entering a port of any sort, was a most significant achievement.